There are winners, and there are losers. We’d like to think we fall on the winning side of life (our Moms do too! ), but we’re never afraid to ask for help when needed. And with that being said, we need your help! It’s not often that we ask you for favors (OK, maybe it is – but, seriously, who’s counting) – so you know it must be serious if we’re asking for your help. We’re in the running for the top prize in WIRED’s Small Biz Competition and it all comes down to votes. We want your vote. We need your vote. We gots’ta gots’ta have your vote! And we’re not too proud to beg. Pleeeeeeaase? Please vote for us? Pretty please? We racked our brains to make the deal even sweeter. As a thank you to our amazing friends and community, anyone who sends out a message on Twitter saying that we are in the running for WIRED’s Small Biz Competition with a link to the contest (Pssst, you can even give them this URL: https://www.crowdspring.com/wired) OR anyone who mentions it on their blog with a trackback to this very post will be in the running to win one of these 5 prizes! It’s the time for giving, and give we shall! 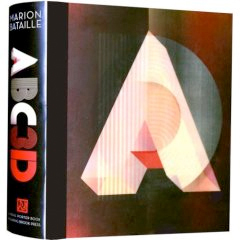 For the typography nerd, ABC3D is a perfect piece coffee table book-meets-piece of art. This item is on many creatives’ wish lists, and we would love for someone in our community to have a copy as well! You read that right. I know this is a stretch, but come on folks…We’re a startup! 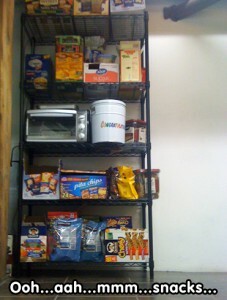 I will hand craft a lovely care package for two people from our office’s ridiculously gynormous treat wall. It’ll be like when you were younger at Summer Camp, and your parents would send you care packages filled with yummy goodness that the counselors always took away from you. Except this time around, nobody’s gonna take away your treats, or they’ll have to deal with us! So, it’s a toss up. What will I send? Organic oatmeal? M ‘n Ms? Generic pita chips? Cheetos? Biscoff cookies? Organic chicken broth? Cup o’ noodles? My Dad’s homemade granola? Pretzels? French vanilla coffee creamer? Whatever it is, you will want it! This is the same brain food that fuels our superhuman team, so it’s gotta be good. At first, you may scoff at this prize, but if you’ve ever wanted to know what fuels our crazy brains, then we are proud to offer up a fine assortment of reading for the spirited, creative, entrepreneurial mind. 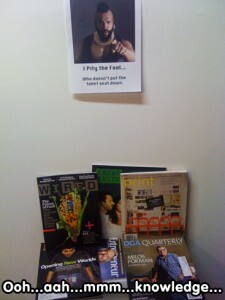 One lucky winner will get a collection of magazines that spans from WIRED itself, Entrepreneur, Fortune Small Business, HOW, Creativity, Advertising Age, Stereophile, The Onion, Directors Guild of America Quarterly (thanks, Mike), Crazy Lawsuits (thanks, Ross), and much more. It’s a pretty sweet – albeit odd – deal, if I do say so myself. 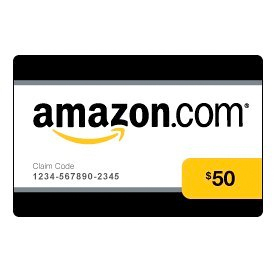 Everyone loves gift cards to websites where you can buy practically anything. ‘Nuff said. Winners will be drawn out of our magic hat next week!